My memory for grocery lists might not be the best around, but certain recipes stick to my head and I count the days until I make them. 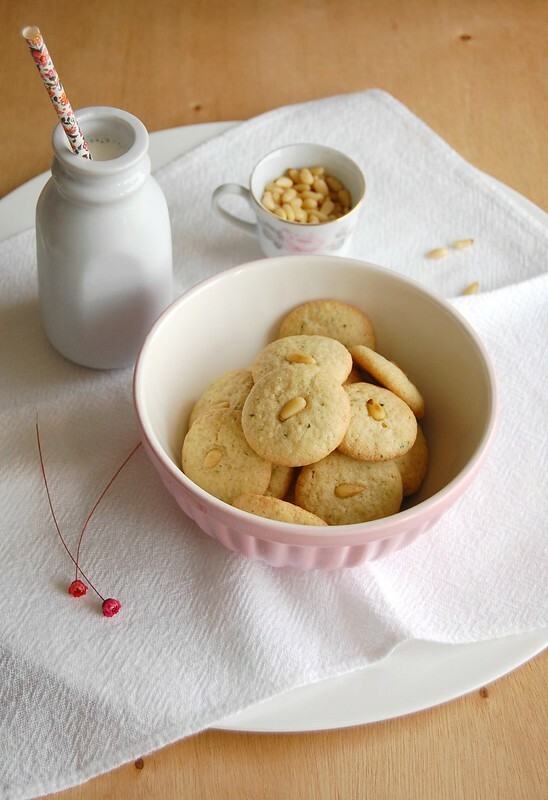 I saw these pine-nut cookies on Martha's website and thought they were really interesting, since it's a regular cookie dough - made by creaming butter and sugar together - but there's the addition of herbs, pine-nuts and olive oil, ingredients usually used in savory recipes. Pine nuts are absurdly expensive here in Brazil, but I brought home some from a "Whole Foods" I visited in NY - they were perfect for these cookies. Preheat oven to 180°C/350°F. Finely chop thyme in a food processor. Add pine nuts; pulse until coarsely ground. Transfer to a large bowl. Whisk in 2 cups (280g) of the flour, baking soda, ginger, and salt; set aside. Put butter and granulated sugar into the bowl of an electric mixer fitted with the paddle attachment. Mix on high speed until pale and fluffy, about 5 minutes. Mix in oil. Reduce speed to low. Mix in flour mixture. Add cream; mix until well combined, about 2 minutes. Mix in egg, then remaining ¼ cup (35g) flour. Shape dough into 2cm (¾in) balls, and space 5cm (2in) apart on baking sheets lined with parchment paper. Flatten slightly with fingers, and top each with a pine nut. Bake cookies, rotating sheets halfway through, until edges are golden, about 13 minutes. Let cool 10 minutes on sheets on wire racks. Transfer cookies to racks to cool completely. Cookies can be stored in airtight containers up to 3 days. Lovely cookies, I like the pine nuts on top! Hey, CT - I'm glad to know the recipe worked out fine with your twists. Thank you for letting me know!